The divas are back! Dynamite Dames is the creation of local playwrights Liz Auston and Conrad Boyce, originally performed in 2004 and one of SCS’s most-requested musicals. Get ready for 2 hours of dynamite performances as the divas and show-stopping hits just keep on coming! 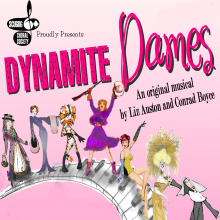 At its heart Dynamite Dames celebrates the spirit of women. For years Jane has lovingly dedicated herself to the wants and needs of a wonderful husband and two nearly-grown kids. A promising performer in a past-life, her only singing engagements in recent years were those during tub time when the kids were little and her dramatic repertoire rests solidly with "Good Night Moon". When a local theatre troupe shockingly earns first-dibs at staging a huge Broadway mega-hit -- with lots of great roles for women -- Jane musters the courage to squelch self-doubt and audition for the show. But Jane is not alone in wanting to shake free of a familiar role, as she is joined by a multitude of over-qualified, talented women who seem to share in a similar dream.